There was only one witness at a congressional hearing about NASA’s budget last week, and he wasn’t even supposed to be there. The witness, Robert Lightfoot, has worked at NASA for years. He arrived at the Marshall Spaceflight Center in 1989 as a test engineer. 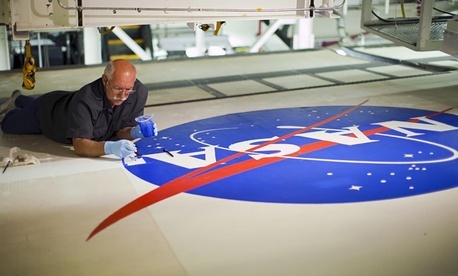 By 2009, he was running the whole place as director, and a few years later, he was number three at NASAheadquarters. When President Obama left the White House, taking all his appointees with him, Lightfoot took over as NASA’s acting administrator. He would step down as soon as the Senate confirmed a successor, handpicked by President Trump. More than 13 months later, that still hasn’t happened. With each passing day, NASA sets a new record for the longest the agency has gone without a permanent chief between two administrations. So it was Lightfoot who was summoned to Capitol Hill to face lawmakers and field questions about the future of a government agency he was never supposed to run for this long. Lightfoot won’t be in that chair for much longer. The acting administrator sent a memo to NASA staff Monday announcing he will retire from the agency, effective April 30. The Trump administration’s nomination for administrator—the person the president wants in the job, as Lightfoot said—is Jim Bridenstine, a Republican congressman from Oklahoma. The White House nominated him for the position last September. Bridenstine has faced a congressional committee in two hearings since, but Senate leaders haven’t brought his nomination to the full chamber for a vote. Republicans have the majority in the Senate, but they may not have enough votes to confirm the nomination. If every Democrat votes against Bridenstine and one Republican joins them, the Senate would need to bring in Vice President Mike Pence to break the tie in his role as the president of the chamber. If more than one Republican joins them, the nomination would fail. Bridenstine’s nomination is contentious outside of Washington, too. The congressman’s decision to invite Bill Nye, “the Science Guy,” to the State of the Union in January was met with both fury and hope from the scientific community. Some saw Nye’s acceptance of the invitation as a betrayal, while others considered it an important opportunity for the popular figure to express concerns about the Trump administration’s outlook on scientific research. It’s difficult to predict how long NASA will go without an official administrator. Bridenstine’s office said in a statement on Monday that the congressman “remains optimistic there will be a confirmation vote soon.” But the fierce opposition on Capitol Hill toward Bridenstine suggests that a leadership void is a better deal than Bridenstine at the helm. The Trump administration decided to formally resurrect the space council last summer and installed Pence as chairman. Since then, the National Space Council has been running the show, and most of the administration’s space-policy directives have come directly from the council. Last October, during its inaugural meeting, Pence gave a speech that laid out laid out NASA’s long-term plans. The space agency would send humans to Mars, just as the previous administration had vowed, but it would put an emphasis on missions to the moon and near Earth, rather than to deep space. Last month, the council said it would organize a “users advisory group,” a collection of big names in the spaceflight industry that includes astronauts like Buzz Aldrin and the heads of SpaceX and Blue Origin. The Trump administration seems to have revived the National Space Council for little reason other than the fact that previous Republican administrations have favored it. In the past, the council had flown mostly under the radar, as just another layer of bureaucracy. This time, it’s a much flashier affair. The longer NASA operates without a Trump-picked leader, the more the National Space Council becomes the face of the country’s space ambitions. Lightfoot is stepping down as NASA grapples with the requests the Trump administration has made in its latest budget plan, released last month, and waits for Congress to put forth its own version. The space agency is also facing potential delays, some of them quite costly, in several programs, including the James Webb Space Telescope, the successor to Hubble, and the Commercial Crew Program, the effort to launch humans to space on transport systems built by private companies. Despite the leadership vacuum, NASA has a pretty exciting coming months. In April, the agency plans to launch an exoplanet-finding spacecraft. In May, it will send a lander to Mars, and in late July or early August, a mission to the sun. It may not be clear who’s going to be running NASA in the near future, but NASA is still running.